Starmino is a variant of the Fillomino puzzle. 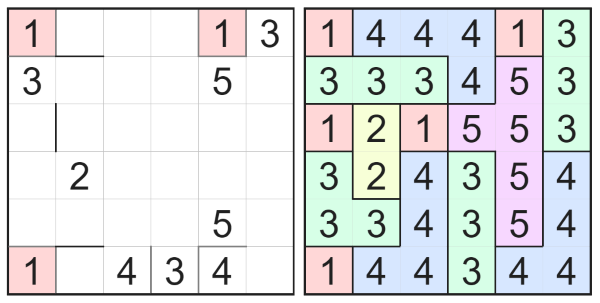 The goal is to tile the board with polyominoes of different sizes in such a way that no two polynominoes of the same size may touch either vertically or horizontally. In the puzzle, monominoes are labelled with the digit 1, dominoes with two digits 2, trominoes with three digits 3, etc. You may see some given tile edges in the starting pattern. These indicate that the cells on either side must be covered by two different polyominoes. The use of tile edges in the puzzle is unique to Starmino. Lastly, not every polyomino in the solution will necessarily have a given digit in the starting pattern. You may need to infer the size and position of "ghost" polyominoes, such as the tetromino at the top of the puzzle above! On a desktop or laptop computer, click and drag the numbers from labelled cells to unlabelled cells. On a tablet or phone, touch and drag the numbers. You cannot drag the numbers back, so use the UNDO button if you make a mistake. The puzzle program will let you make an incorrect move, but will not let you make an illegal move. If you solve the puzzle correctly, the display will change to indicate success. There is only one correct solution which you can find by logic. If you want to reset the puzzle to the starting point, click or touch the *mino logo and choose RESET.